Synopsis: Student Council activities sure is boring for most of the students since they can't bump into any kinds of fun things unless it's for developing your school and enforcing rules and such. That doesn't seem to be the case to this runaway-princess right here, Patricia Meadowhart. She makes a club that will exercise her socialization and to learn more about food for she have this 'little' problem of not able to tell the difference between good tasting and bad tasting lunch food. Casts: Everyone, Moge-ko, disguised as a student with beast-like ears, (check spoiler for reference.) minor characters of your choice. Completion Conditions: Mogeko recruited main casts, Patricia persuade teachers to supervise the club. Re: Timeline 2/Event 1.1: Brilliant! A newly established OBENTO CLUB?! Early in the morning, this blonde student with a head gear-like cat ears is sitting on a mono block chair next to a wooden table, she calmly leans her elbows to the table, head to her arms to rest while waiting for people to come by. The girl sighed. "I did agreed with that mogeko on a whim but, I never thought that I have to wait for these pathetic high school students to come by and sign some papers on my left. What a load of moge-crap." She currently staring at people, waiting for them to go near her but her sharp stare scares the students away. She got a bloody deep stare that even the bravest of the knights would go wimping and screaming like a little girl. "I shouldn't have make myself too beautiful for this, they're too scared of my beauty." She sighs some more since she might even take a head or two when she had enough of waiting for someone to take her flyers and application papers. More to it, she seems to be more annoyed by the time she's doing monologue. "ARRRG! HUMAN WORLD IS BLOODY BORING! I WANT BLOODBATH! BLOODBATH!" In an irritated manner, she got lots of attention she wanted. People stares at her looking worried, worried that she might lose it. On the other hand, Patricia goes to the faculty office since she heard that some faculty might go early since they need to supervise some of the clubs and she might find someone that might approve her current idea. She's at the faculty as of today and so she sees no one, yet. "I am aware that this is a peculiar club... But I do believe that this should get approvals..."
A worrier like her usually gets driven aback when experiencing failure due to rejection but her inner thoughts reassuring that this should get an okay sign. Door opens. Someone enters the faculty room, Maria gets up and sees who it is. "Ms. Meadowheart, what is it that you need in the faculty room?" Maria asked the Patricia. It's Miss Kannazuki, perfect timing. "Good morning, Miss Kannazuki. I barged myself in since the faculty isn't locked, I thought people might be inside so I forced myself in..."
Of course, it's pretty suspicious for a student to suddenly goes inside the office without someone letting them in. She's holding onto some papers, documents that represents her proposal of some sort. Akari happend to pass by. She noticed that the clubs have finally been established. She looked at them one by one until she reached the blonde student. "Oh? It's a high schooler!" From a burst of excitement, she stands and welcomes Akari as if she knows who she's dealing with. "Obento Club! It's a club where you can eat human food during lunch time and mingle with your friends! I assure you will enjoy your every lunch time if you got friends with you on the roof top while smelling the breeze of spring or just be casual while eating!" From the tone of her voice, she's eager to convince the first one to confront her inquiring stuff about the club. "Just pick up these two different papers on the table. It got flyers and application form if you want!" Merrily, she points out two neatly stacked papers on the left side of the desk. "Oh okay. Thanks for the offer anyway. Good luck with your club"
Akari answered back and quickly backing away from the blonde student. Livia, being Livia, was rolling her way around the corridors when she zoomed past a recruitment booth. It seemed like any regular booth at first, but two classrooms later she realized just what was sitting there and with a move like a stuntwoman, she flung herself into a U-turn to double back . And there it was, disguised, but still unmistakably yellow. It was the little magical creature that the student council president kept as a pet. Swerving over to stop in front of the table. "Excuse me, but you look very familiar. Have I seen you before?" He recognized that English tone,turning to the owner who was conversing with his colleague. Seeing as he was unoccupied for the time being, Torashiro decided to pique his curiosity. She's about to ask a favor when she noticed who's inside the room with Miss Kannazuki. It's Mr. Torashiro. Her world seems to stop, it's the instructor who wanted to punish her by running on laps from the last time. This is her first time experiencing fear. She couldn't even make sense of what she's saying after saying his name. . Yes she's been trained to be a ruler back at New England but seeing a blind teacher smashing the table into smithereens is quite a show for her. Actually too much of a show. She sits in a girly manner caused by her fear. She's still holding onto her paper but she might snap if the male instructor doesn't reassure her safety. 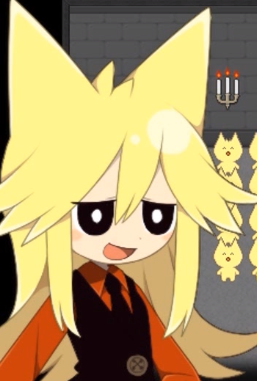 At the other end, the blonde haired student with mogeko-like ears is still struggling from recruiting people. After Akari, a lot of people are backing away since she spend a lot of minutes getting worked out from rejection. She usually does not take no for an answer but now's not the time to be on her usual nature. "What do we have here, it's the rockstar. How's it going?" With a big grin, people seeing her smile feels that they should back out a bit more. And she did the usual recruitment speech of hers. "Take one of each of these papers, I bet you'll enjoy joining the club!" The big borderline psychotic grin that was scaring the crowd away had no effect on Livia, who instead leaned her hip on the table and took the flyer that the eerily familiar girl handed her . "Bento Club huh?" she said "Where does the bento come from? And are you sure I have never seen you before?" Around them, people were slowly gathering, forming a circle around the two as if drawn in by the idol but fearful of the recruiter. His accent defaulted back to native tongue, oh come on, he knew he came off as abrasive but he wasn't a bloody damned murderer. Raising his arm in surrender,he could recognize the tone of fear more or less, to try and defuse the situation. Speaking again in english to try and prevent her from getting the wrong idea. "Look,I'm not going to do anything. I'm just curious as to why you're here, that's all." "Torashiro-san, you musn't scare our students like that." Maria said to her fellow educator as if she was the latter's superior. "Ms. Meadowheart, is there something that you need? Or someone?" Maria asked Patricia as she was trying to calm the obviously nervous student. "I...uhm, excuse me for a bit." She dusted herself, straighten her posture, fix her clothing and clears her throat in a ridiculously quick manner. "As I was saying, I'm about to propose of creating a new club." Before people could say anything, she puts out a laser pointer and uses it on a wall. From that laser manifested a chart about stuff she's about to explain. "So, as we all know, population of the clubs are divided into middle, high and college clubs... I'd like to break that barrier so people of ages would have a reason to get along. And so I suggest that we must open this club I would call Obento Club where people can experience socialization while being indulged of having a feast. " He restrained himself from sighing, stepping back,"My apologies Kannazuki, Meadowhart." "What do you think of it? ",the technically more senior educator turned to his colleague again,curious as to what their take would be. "I think it sounds fine, no one is going to get hurt or in trouble anyway." Maria said to Patricia as she turns to her senior. "So Torashiro-san, why don't we get this approved?" Maria asked her senior while giving Patricia a somewhat look of assurance. "Sure,why not? ",hearing his coworker's input, Torashiro nodded in agreement. People would be less liable to try and fight when food was involved as far as he knew. "Do you have any prospective members lined up for this club? ",was his next question for Patricia, hardly anyone would propose a club idea without at least a few people in mind. "Club members... Hopefully I have plenty of time to gather members for this club but since this club is for all levels, I assume that there should be at least two advisors. For this I need the two of you to supervice the club... So, are you guys going to heed on my request?" She turn of her laser pointer. She's waiting for the two teachers to respond to her request. "I've got no problem supervising such a club. ",the more senior educator shrugged again, while he missed the presentation her words had gotten the message across fine on their own. He was used to watching over students anyway,and hey at least this way there would be more food involved. A pretty good deal overall. Her club finally got an approval and support from two different faculty member. She then proceed in giving them paperwork for approval of the club and stuff necessary to make a club. And so she's waiting for the two to sign those papers. A slight change of her lips can be seen from her suggesting that she's smiling. Thinking that she will change things. On the other hand, the blonde, cat-eared student is still waiting for anyone to take her flyers or something. "Huh, a really peaceful place... I'M ALREADY ITCHING FOR A FIGHT! ESPECIALLY THAT AKARI WOMAN! ARRRRRGGGH!" She still does her loud ranting, some could hear her, some can't. Others notice her greatly, while most of the people treat her that she doesn't even exist. People are pretty much busy in this country. Livia had taken a seat next to this unnaturally yellow haired and pointy eared student and had taken it upon herself to eat her packed lunch there as a demonstration of what the club is all about. As she ate, she reached forward to tweak her companion's ear, a plan that was cut short when she exploded in anger. "Whoa, calm down there!" she exclaimed as she regained her balance from nearly falling off her chair in surprise "Why are you so angry at Akari-chan anyway?"